Shadow chancellor George Osborne has ruled himself out of standing for the Conservative leadership. 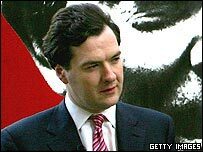 Mr Osborne's promotion last week to one of the top shadow cabinet jobs fuelled speculation he would enter the race to succeed Michael Howard. But the 33-year-old told the Daily Telegraph: "I am making it clear, I would not be a candidate." Mr Howard wants to stand down by Christmas but nobody has formally said they will try to succeed him. Mr Osborne's decision leaves shadow education secretary David Cameron as the potential standard bearer of the younger generation of Tory MPs. But Mr Osborne rejected suggestions he and Mr Cameron had formed a "Granita pact" along the lines of the supposed agreement between Tony Blair and Gordon Brown formed in the Islington restaurant of that name. "David Cameron, who is a great friend of mine, and I have not been to Granita or anywhere like that and done some deal. I have made no deals with anyone," Mr Osborne told BBC News. Mr Cameron meanwhile told Sky News that he was so sick of the Blair-Brown question that he was thinking of "putting it to music". But it is not yet clear whether Mr Cameron, 38, will be a candidate either. Mr Osborne and Mr Cameron have been dubbed the Blair and Brown of the Conservative party after entering Parliament together and being tipped as future leaders. Other contenders for the Tory leadership could include shadow home secretary David Davis, shadow foreign secretary Liam Fox, shadow work and pensions secretary Sir Malcolm Rifkind and former Chancellor Ken Clarke. Mr Osborne said: "I have a big enough job being shadow chancellor opposing Gordon Brown and developing an economic policy that broadens the appeal of the Conservative Party." What's in the PM's in-tray? Can Blair's new team deliver? Who should lead the Tories?